Does egg size matter in recipes? What happens if you use extra-large eggs instead of large eggs in a cake? Is it really that important? Let’s find out! Let’s discuss eggs. They play an important role in recipes, offering flavor, color, stability, structure and leavening to countless baked goods. As you may have noticed by now, the majority of recipes in cookbooks and online call for large eggs (with the exception of Ina Garten. Ina, stop being weird). Perhaps you’ve found yourself wondering on occasion… does size really matter? As it turns out, bigger isn’t always better! Does it matter if you substitute extra-large or medium instead of large eggs? Short answer…yes. The long answer? Still yes, but let’s take a closer look at why egg size makes a difference. 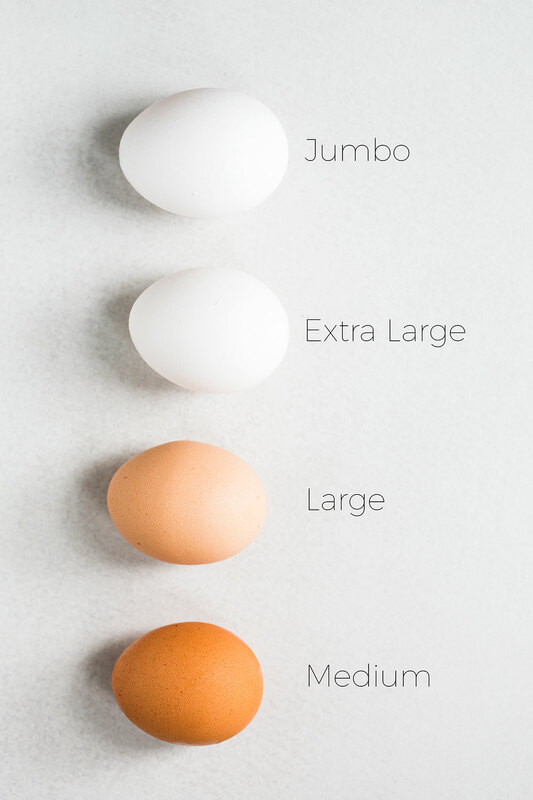 What Are The Different Egg Sizes? Of these, medium, large, and extra-large are what you’ll most commonly find at the grocery store (sometimes jumbo as well). You’ll rarely see peewee or small eggs, but keep an eye out at the farmers market if you want to try them and you might get lucky. 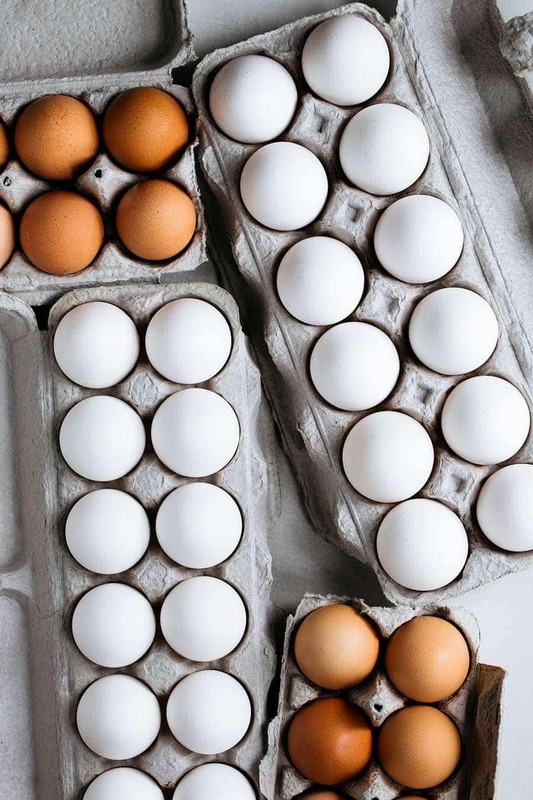 Why is it helpful to know the weight and yield of each egg size? 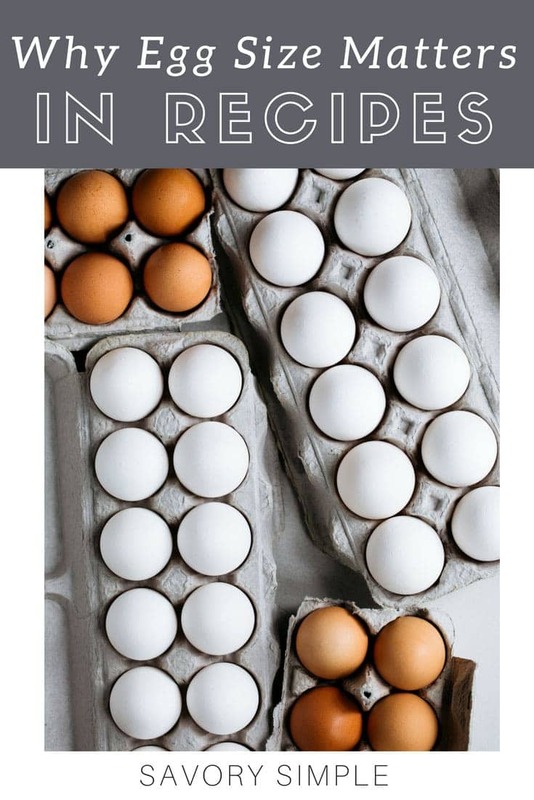 First, so you can understand how to make substitutions in recipes, and second, so you have the option to use farm-fresh eggs from your own (or your neighbor’s) chicken coop. 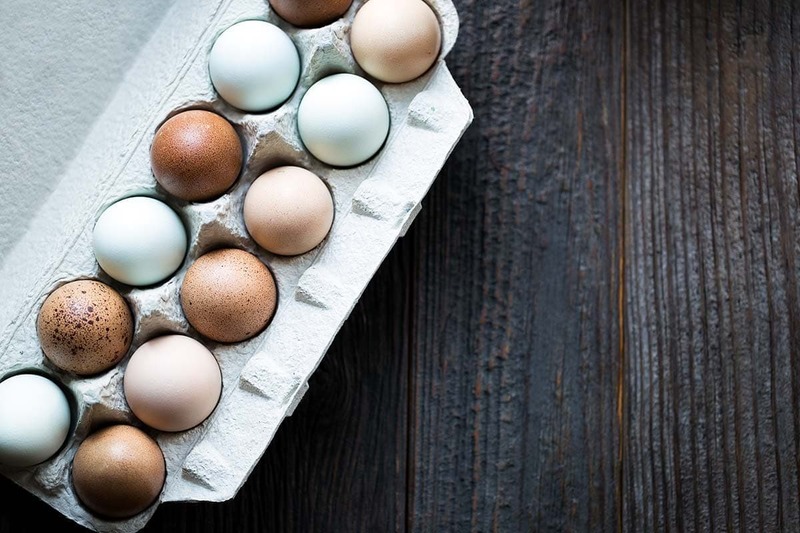 Shockingly, eggs don’t come out of the chicken pre-labeled with their appropriate size, and you can’t assume that those beautiful blue eggs from your neighbor’s farm will be a one-for-one swap in baked goods. If you want to use farm eggs in your grandmother’s famous chocolate cake recipe, you’ll need to do a bit of math on a kitchen scale to make sure you’re using the right amount. So why exactly is it so important to use the right size eggs when you’re baking? Eggs perform several jobs in baked goods. They provide structure and leavening (consider an Angel Food Cake where the majority of the batter is whipped egg whites), as well as color (for example, yolks are what give a Classic Yellow Cake its color). Every recipe is written with specific proportions in mind. Using a different size egg will alter the liquid ratio in a recipe and also potentially deprive it of the required leavening power (or provide too much, which might cause a cake to rise too quickly and then collapse). What if a recipe calls for one large egg and you only have extra-large eggs? Will a small amount of additional liquid make that much of a difference? Probably not. Be particularly wary, however, of going rogue when the recipe calls for more than one egg; the more eggs you substitute, the more the proportions will be thrown off, and the greater the likelihood of a recipe disaster. If a cake recipe call for four large eggs, substituting extra-large eggs would mean adding 3 additional tablespoons of liquid! It’s fine to substitute one egg size for another if you’re willing to take the time to weigh the ingredients. As we’ve already pointed out, you need a kitchen scale if you want to use farm eggs in baked goods. Let’s use the above example, where you have extra-large eggs and the recipe calls for four large eggs. Simply break out that kitchen scale and place a bowl on top. Crack in the eggs until you get to 8 ounces or slightly over. You can then whisk the ingredients together and scoop out the excess egg until you have the 8 ounces required for the recipe. Alternately, instead of whisking, you can scoop out a bit of the egg whites or one of the yolks, if that will get you to the right place (I recommend removing the whites over the yolks, if you go this route). So when is it ok to substitute eggs without measuring? After all of that, you may be surprised! You mainly need to be concerned with baked goods when it comes to egg substitutions. Deviled eggs, scrambled eggs, frittatas, shakshuka, or recipes with fried or poached eggs are just a few examples of ways you can use these other sizes. Just make sure to consider that smaller eggs will require a little less seasoning, while extra-large or jumbo eggs may require more. Adjust salt and pepper as needed based on the size eggs you use. Looking for some baked goods that use large eggs? Cakes are always a great place to start. Try Rum Cake, Dark Chocolate Cupcakes, and Super Moist Pineapple Cake! Cookies and quick breads are other staples where large eggs are often a key ingredient. Chai Cutout Cookies and Applesauce Bread are two fan-favorites. Don’t forget the brownies and blondies! Chocolate Brownies with Salted Tahini Frosting and Maple Walnut Blondies are easy to make and will disappear in a flash. Stephie grew up helping her mother in the kitchen, where she learned the value of cooking with fresh ingredients and the time-honored skill of making a killer pie crust. She works full time in marketing and in her kitchen by night, usually alongside her husband. Outside the kitchen, she’s an avid reader, animal rescue fanatic with two dogs and two cats, and lover of mildly-trashy reality TV. Visit Stephie Cooks for great recipes and tutorials!